Like many VPN services, DotVPN is also a VPN provider believed to encrypt your data traffic, unblock websites and streaming content. They have created a long user list which is almost 880,000 on Chrome Web Store. There hasn’t been a long time since the DotVPN has been launched and from 2014 it has taken over the other VPN services with more than 10 million downloads from 160 countries all over the world. 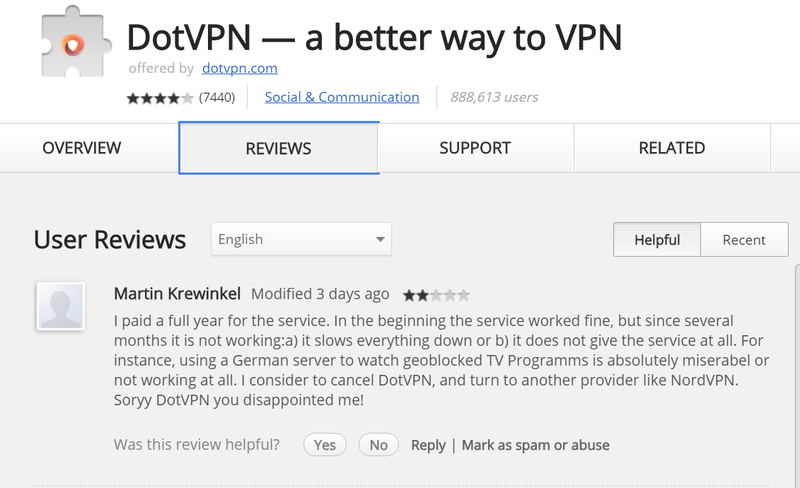 DotVPN is a Hong Kong-based VPN service that has gained almost 7000 user reviews with 4 out of 5 stars on Google Web Store. It is a free VPN extension but also offers premium services for advanced features. They claim to have servers in almost ten countries which are open for users of both premium and free version to switch in between them. DotVPN could be download as a browser extension for Chrome, Firefox, and Opera with app software available for Android and iOS. However, their website doesn’t have enough information about the company owning DotVPN extension. They have just displayed their address and some business goals. They have the policy to store the real IP address of an individual for 24 hours which is to avoid issues such as spam, fraud or another malicious deed. According to their website, they have many efficient features which become more advanced for their paid customers. The foremost advantage of gaining user attraction is their server location which could help them to bypass most of the content restrictions and online blockades. DotVPN claims to provide 4096-bit encryption to their user data which seems a bit shady. This is because they are referring to RSA although this also has 2048 bit. For what we have found for our readers is that they actually use AES 128 bit and AES 256 bit, however, RSA is used for handshake and exchanging of symmetric (AES) encryption keys. The purpose to use such tactic is to make their VPN stand out from all the others. DotVPN states an ease of connection with a simple single click connection. Also, they claim an efficient unblocking performance due to their server locations, however as tested by us and addressed by many other users, the VPN is unable to access popular content such as NetFlix and Hulu with USA server. A thing you must remember is that a VPN is of no use when your identity is at risk. This is the case with DotVPN too; a user’s IP address could be leaked as a result of unavailable WebRTC blocker and flash player. The performance of DotVPN extension is checked through various testing tools so that we could provide our readers with authentic information saving them from difficulties after considering it. For Speed, we have used tools such as speednet.net and fast.com to test the performance of DotVPN. Like most of the VPN services it also makes the speed considerable slow. The percentage shown by testing tools were not such sluggish as compared to what we have experienced while streaming content and uploading websites especially the ones requiring a bit heavy data. It has an easy Usage as tested and experienced by us. You could connect easily to the browser add-on as well as to the mobile app also. As far as Customer Support is concerned, it is a bit sluggish and users are given an extremely slow response. Mobile Application of DotVPN performs better as compared to the browser add-on. However, you may experience some speed issues on the mobile software too. Most of the users that have shared their experience on Chrome Web Store have addressed the issue of server connection, especially with the free version. However, many users are disappointed with their premium version too, saying that the performance remains inefficient as they were experiencing while using their free version. Whether, it is the server issue, accessing content such as Hulu or Netflix, and facing the same speed issues. This is where a user get annoyed due to these serious issues which keep on increasing as the user remains connected to DotVPN. Experiencing all this and addressing such responses we have filtered out some of the good free VPN extensions as compared to DotVPN having relatively fewer issues. Having a VPN is not just enough. You must select the one which is secure enough to protect your data from potential threats such as cyber attacks, government surveillance, and third-party data snoopers. Many of the VPNs are not efficient in providing sufficient security and are involved in data leaking, without the user being informed about it. However, an intelligent approach is to check your VPN connection, no matter which VPN provider you are using. This is the case with DotVPN also. Its privacy and user’s data security policies are vague with some contradicting statements. Like every VPN provider, DotVPN also claims to encrypt user’s data traffic but also states its policy to monitor their online activities. Although, DotVPN claims this behavior as a step to improvise the online experience and their services, however, once information is out of protection, anybody could sneak through it. Also, they transfer your browser cookies to their own servers. Such policy if not misused by the company could provide a relatively simple data access of the users to the ones with malicious deeds. Therefore, an individual really wanting security will never compromise especially for the thing they are confused about. Also, when you have various options then you must select the one which you think is most suitable and worth considering. However, one thing that couldn’t be overlooked is that a free VPN or a VPN extension could not be as efficient as a pure and full pledge VPN services. Cyberghost is a free proxy that has also released a Cyberghost app that could easily be installed on your device whether it is a PC or a mobile. They claim to provide your data complete security and anonymity while unblocking content but their main goal is to protect. It has an easy to use browser extension with the simple log-in process. The Chrome extension of CyberGhost VPN is extremely convenient for use as it makes sure an uncomplicated, one-click enabling and disabling. With CyberGhost free VPN extension you are provided with almost every necessary feature such as Unblocking restricted content, evading potential cyber attacks, and most importantly the anonymity with data encryption. However, these all features are boosted to an extraordinary level with their premium services that have, even more, features to look for. TunnelBear is a popular VPN extension all around the globe. It could be a great solution for the ones seeking privacy especially those who regularly connect to an insecure Wi-Fi network or are mostly connected to public Wi-Fi. Through this protective feature, the users are provided with a secure browsing experience without the risk of online tracking. 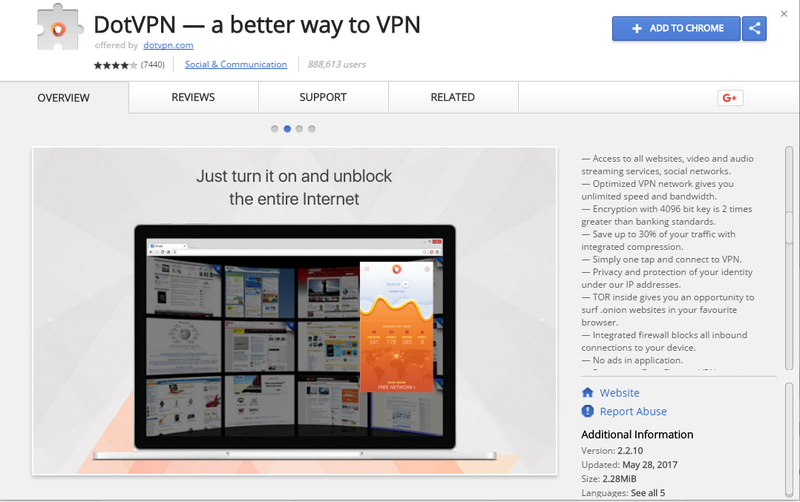 According to Chrome Web Store, TunnelBear is a VPN service joined over by more than 14 million users who have an easy single-click connection. However, like every free VPN, TunnelBear also have an issue regarding heavy streaming content especially Netflix. But these issues could be catered to a much greater extent when a user switches to their premium service. When talking about anonymity, Tor browser is a constant popularity gaining software encrypting an individual’s data. It prevents an insecure website to risk your privacy and evades the chances of data tracking by any such online source. Tor browser VS VPN services, you may experience a relatively slow speed but it also provides you with almost the same features as VPN. They could make your browsing experience more secure through restricting malicious and unwanted data snooping. However, the blocked sites could also be accessed through connecting Tor browser. You could easily connect Tor on Windows, Mac OS X, or Linux without downloading any software. Among thousands of free VPN extensions, Browsec VPN is listed in some efficient ones those are preferred by many users around the world. Despite the fact that almost all the free VPNs have some serious issues endangering user’s privacy, Browsec VPN hasn’t posed an immense threat to privacy. With Browsec VPN you could access most of the blocked content which is inaccessible without any proxy. Also, a major concern and risk while accessing such site could be data tracking and identity exposure that is almost vanished through IP obscuring by Browsec. However, you could get all these features with a simple connection process i.e. single click VPN enabling and disabling. 5 – With Gom Web VPN, you could get a possible protection without investing money. As compared to many free VPN extensions this could be a much better solution to your online hassles. It could be accessing blocked websites, bypassing unwanted tracking and also the data protection through encryption. Like all the free VPN services it may respond slow but that’s not a concerning issue as far as you are secure while being online. Also, some users complain about their slow and unresponsive customer support. You must have seen many downloads of a free VPN despite the fact that they pertain many serious issues. This is because an individual gets into the user list after viewing some attractive features displayed by most of the VPN extensions. However, most of the users face annoying hustles immediately after downloading such VPNs including DotVPN extension.Comment from discussion Is Hola VPN extension worth downloading?. Therefore, our recommendation is to invest your money instead of risking your privacy. Some of the best VPN providers with efficient features and great customer response are now available at an amazingly low cost such as NordVPN and ExpressVPN.